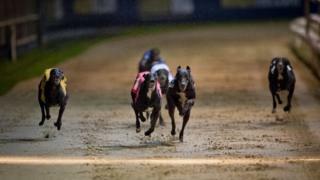 Image caption Campaigners say greyhounds are being over-bred for the gambling industry, and many dogs are becoming "disposable commodities"
A racing greyhound was found dead with its right ear cut off in what is believed to be a crude tactic to prevent its owners being traced. The female dog was discovered "dumped like rubbish" in the Overton area of Lancaster. Racing greyhounds are tattooed on their right ears, and it is believed the ear was cut off to destroy identification information. Campaigners are offering a £2,000 reward for information. Greyhound protection group Caged North West was first alerted after spotting a photograph of the dog's body that was shared on the internet. It then discovered the animal behind a water tank a few yards from Main Street. The group later placed CCTV in the area, which recorded footage of a person with a dog searching the small area of ground behind the water tank. Trudy Baker, of the Greytexploitations group, which has joined Caged North West to offer the reward, said it believed whoever dumped the dog had returned to the scene to remove the ear. "It's incredibly sad but greyhounds are over-bred for the gambling industry, and the ones that no longer make the grade become disposable commodities," she said. "We are hoping that this case ends in a prosecution." The campaigners said they would hand the CCTV footage to Lancashire Police. A post-mortem examination of the animal was due to take place.